On Super Sunday, the alefs and bets in Green Bay and Pittsburgh will be thinking about X’s and O’s. They’ll even be up for a little friendly wager. On the morning of Feb. 6, many hours before the NFC champion Green Bay Packers battle the AFC champion Pittsburgh Steelers in Super Bowl XLV, Rabbi Shaina Bacharach of the Conservative Congregation Cnesses Israel in Green Bay says her religious school will square off against the school at the Or L’Simcha, Tree of Life Congregation in Pittsburgh. Shelly Schapiro, the Pittsburgh school’s director of education, says the schools hope to connect through Skype and “verbalize our challenge to each other,” adding that she hopes to raise some “ruach,” or Jewish spirit, with the activity. After all, cnesses Israel has a Packer connection: “One of our members, Rick Chernick, is on the team’s board of directors,” she notes. The activity between the Wisconsin and Pennsylvania schools is part of the game plan of fun and tzedakah-oriented events being executed for adults and children on Super Sunday. Synagogues and men’s clubs of most Jewish denominations will be among those joining the religious schools in holding events for the big game in suburban Dallas featuring two of the National Football League’s storied franchises. 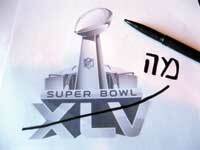 In Pittsburgh, a local men’s club has arranged a Super Bowl pool to raise money for an Orthodox synagogue. Ticket-holders will have their names entered on a “you pick the score” game that is set up on a printed grid. The score at the end of each quarter determines the winner. In shul, like everywhere else in Pittsburgh, the Steelers are the topic of conversation, Moritz acknowledges. “But only after kiddush,” he adds quickly. At B’nai Israel, a Reform temple in Oklahoma City, Super Bowl Sunday also will carry an element of chance, albeit gastronomical. The temple brotherhood, which organizes the Super Bowl party, prides itself on baking homemade pizzas for the crowd. Brotherhood president Lou Barlow, the veteran organizer of the event, hopes to introduce this year a dessert pizza he calls “The Elvis” made of peanut butter, bananas, and syrup – reminiscent of the King’s favorite sandwich. “What could possibly go wrong?” he asks. The brotherhood also uses the occasion to hold a “Souper Bowl” by collecting cans of soup for Oklahoma’s Regional Food Bank. Elsewhere in the Midwest, in Nebraska, Yachad, the National Jewish Council for Disabilities, plans on using Super Bowl Sunday to level the playing field for the developmentally disabled. Janet McCarthy, the Omaha program coordinator for a New York-based organization affiliated with the Orthodox Union, says Yachad’s Super Bowl party will be held in a rented elder-day-care center with a large-screen TV. “Everyone is looking forward to the Black Eyed Peas,” she adds, referring to the popular band performing at the intermission. Heading south to Mobile, Ala., a day that highlights intense competition may introduce an atmosphere of cooperation for two synagogues. Jonathan Siegel, the Super Bowl party organizer at Cong. Ahavas Chesed, says he’s inviting members of the neighboring historic Spring Hill Avenue Temple, a Reform congregation, to his join the crew from his Conservative congregation. “Let’s Come Together,” suggests the party flier. In downtown Dallas, not far from Cowboy Stadium in suburban Arlington, Chabad is inviting out-of-town Packers and Steelers fans to put aside their rivalry for a day or two and join them for a Super Bowl Shabbat. “We are expecting fans from all over,” said Zvi Drizin, a Chabad-Lubavitch rabbi who often works with young adults. Shabbat morning services the next day will feature the Torah portion Terumah, which is about the building of the Mishkan, the holy sanctuary. Drizin, who is still trying to find a ticket for the big game, is planning on giving the d’var Torah. Edmon J. Rodman writes on Jewish life from Los Angeles. E-mail him at edmojace@gmail.com.